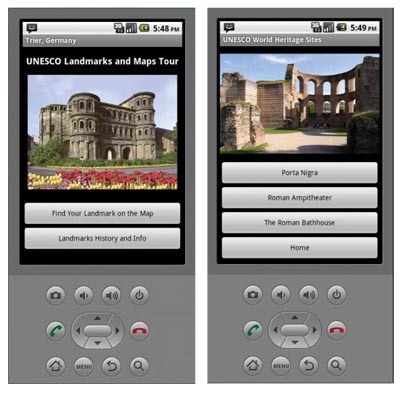 The Trier walking tour and landmarks apps gives the user some history plus a pictorial reference to each UNESCO site featured on the app as well as access to Google Maps. This week’s EDTECH 597 mobile app broke through many of the challenges that I’ve wanted to resolve for weeks, but didn’t quite know how. The original theme of the app in the book was “Paris Maps Tour,” which I changed to a “Trier, Germany UNESCO Landmarks and Maps Tour” mobile app. Through the process of developing this app, including its many prototype incarnations, I finally was able to not only create an app with more than one screen, but also change pictures on the app depending upon which button I pushed and to access the internet via Google Maps. This maps portion of the app development was also part of the original assignment. The various incarnations of this project were many pages long—I think about six. However, for the final one, I turned in just a 2-page app. The multiple page app had a few bugs that I really wasn’t able to solve this week. However, I’m not sorry I went down the road that I did, because I’m looking at each app as a way to direct my thinking for my final app. I know that I want that app to have multiple page and audio capabilities, so I’m pushing the envelope as far as I can on each assignment to see what kinds of abilities I’ll be able to bring to the table and to give me an idea of what kinds of problems I’ll be able to realistically solve during the process even if I don’t have all the know-how now. As I mentioned in last week’s post, I often solve problems for previous apps as I’m working on another app. In fact, the answer to one of the problems that I had for that app—how to increase a line size—came to me and now I know how to do that. Additionally, this week once again taught me that it’s the nature of good design that it solves problems. I am reminded of the stories that I’ve heard about when Peter Jackson was directing Lord of the Rings. He needed to be able to create large scale orc armies on screen, but at the time, there was no software that could do that so his production team created a program called Massive that would design individual orcs with their own decision-making capabilities on-screen. Jackson said that he was forced to create these solutions, because he lives in New Zealand and didn’t have access to larger production houses like Sony or Industrial Light and Magic. If he wanted an effect in his films, he and his team had to create it. I’m starting to really look at app development in this light. Currently, I work as a travel writer. One of the things that the company that I write for is doing is starting up walking tours of Cascade, Idaho with the idea that they’ll have many tours eventually. I thought about this and about the experience I had when I visited Trier, Germany several years ago. While I was touring the Karl Marx House Museum, I was given a hand-held device that told me about each exhibit. This week, I wondered how I could bring the type of information that the hand-held device gave me to the mobile app experience. It would have been cool to have an app for each of the sites that I visited in Trier—one that would give me a bit of information about each site plus a pictorial reference so that I would know that I was at the right place. I then brought my thinking a bit further by applying these same lessons to the walking tours we’re currently doing. In reality, it wasn’t until I wrote this post that I realized what kind of economic impact this could have on the business I work for. It didn’t even really occur to me until I wrote it that we could save manpower, but still make money by developing apps like this. It was a good breakthrough!